Alpine Network of Protected Areas - "ALPARC"
The Alpine Network brings together all large protected areas (over 100 hectares) with field workers and activities (land management, managing the general public). For the last 10 years, the Network has facilitated a wealth of close contacts between the Alpine parks, nature reserves, biosphere reserves, quiet zones and many other kinds of protected areas, not to mention the contributions from nature conservation agencies and institutions, local stakeholders, local residents and scientific experts. Raising awareness, informing and educating the general public and the local population about the natural and cultural assets of the Alps. It also seeks to encourage cooperation on developing communication tools, on European projects (INTERREG, LIFE, …) and on education and cooperation tools for the Alpine protected areas. 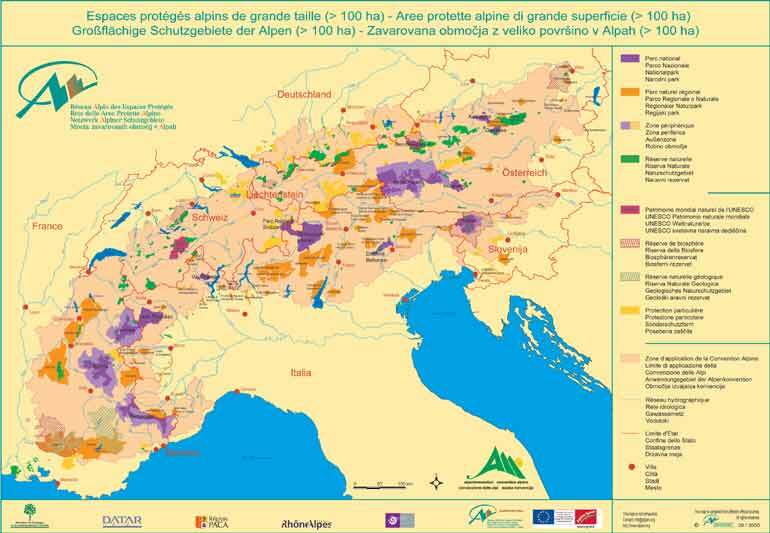 At present, the map of the Alpine protected areas and the corresponding database cover over 800 protected areas > 100 hectares in the 8 Alpine countries, which represents about 23% of the Alpine Convention Area. The map is available in paper in A4 format or as a poster.